Preheat oven to 375 degrees. Place potatoes in a casserole dish and drizzle with two tablespoons of olive oil, before adding the garlic cloves, thyme sprigs, one teaspoon of kosher salt, and six cranks from your pepper mill. Cover potatoes with a lid — or secure aluminum foil over the top — and bake for 30 minutes, or until tender. Bring the steaks to room temperature. Place the beef stock in a small sauce pan and bring to a simmer over high-medium heat, then reduce until one half cup remains, about 10 minutes. Set aside. Heat a large cast iron pan over high heat. 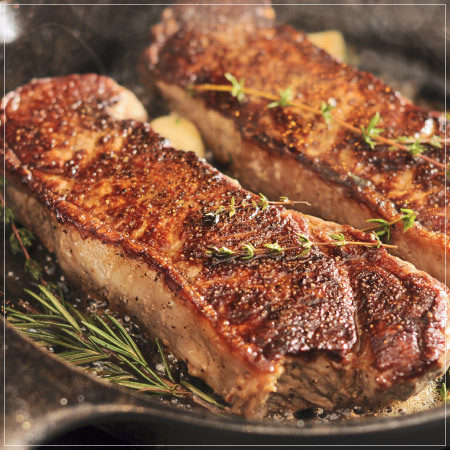 Dry the steaks with a paper towel and season both sides with salt and coarsely ground pepper. Add the teaspoon of oil to the pan; when the pan starts to smoke, add the steaks and lower heat to medium. For medium-rare, cook five minutes on each side. Rest the steaks, out of pan, for five minutes. Remove any oil-grease from pan, then add the whiskey to deglaze the pan. This does set the occasional pan on fire, but do not be alarmed. It always — eventually — burns off. Continue to scrape the pan, over heat, for 30 seconds, then add your stock and cracked pepper. Bring to a simmer and cook for five minutes, until the liquid is reduced by half. Stir in the cream and cook until reduced by half, approximately three minutes. Season to taste. In a medium-sized sauté pan on medium heat, add a tablespoon of olive oil and the diced shallot. Cook for one minute. Add the spinach, cooking for just one minute, until wilted. Remove from heat and season with salt, and sherry vinegar. Slice steak across the grain into thin 1/4-inch slices. Place the strips on four warmed plates, distribute the potatoes, with the wilted spinach on the side. Generously drizzle the sauce atop the steak. 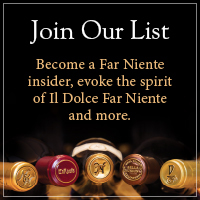 Enjoy with a generous glass of Far Niente Cabernet Sauvignon!